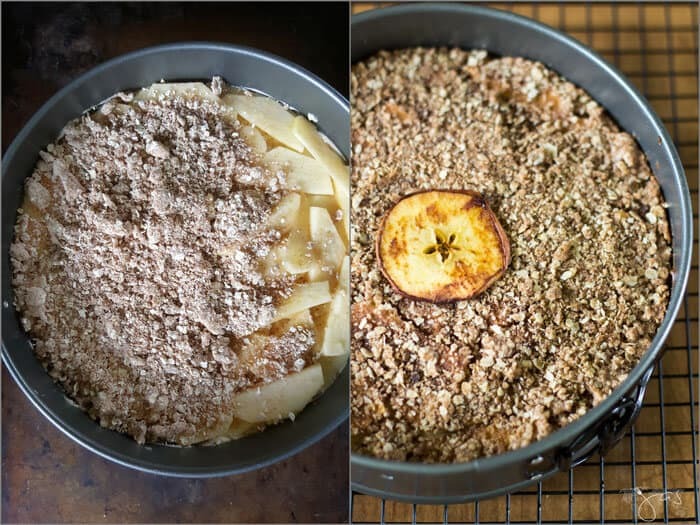 For this Bavarian Apple Oatmeal Streusel Cheesecake recipe, I‘m happy to partner with Rodelle, Dreamfarm, Casabella, Flahavan’s Irish Oatmeal, Pyrex, Chicago Cutlery, Rainier Fruit, and Veggie Wash during #appleweek. They provided giveaway prizes (make sure to enter!) free of charge and provided more than 25 bloggers with samples and product to use. All opinions are my own. Also, this post might contain some affiliate links for your convenience. Click here to read my full disclosure policy. Do you like starting your day with something amazingly delicious? 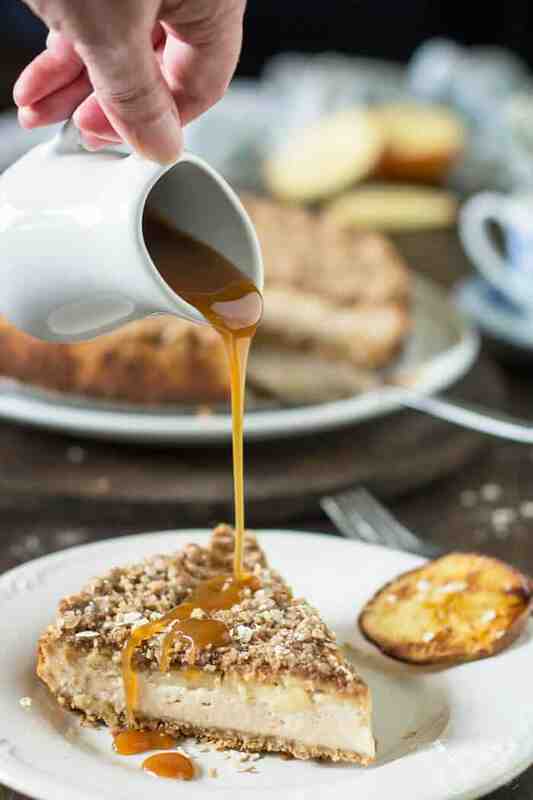 Then you need this Bavarian apple oatmeal streusel cheesecake recipe in your life because this dessert is the best of cheesecake and apple pie combined. We all know apple pie is an autumn must-have dessert and we also know how addicted I am to cheesecakes. By the end of this post, you’ll learn how to combine these two recipes, because you need to be addicted to cheesecakes too so we can be best friends. After all, why would you have it for dessert when you can treat it like an entire meal? My husband’s favorite pie is apple pie but he doesn’t care much for cheesecakes. One bite of this goodness with oatmeal cookies for a crust and he was sold. In fact, we ate the entire cake in one day. There was nothing left to start our next morning with and it kind of set the (sad) tone for the rest of the day. With this in mind, you might need to make two batches so you have some for the next morning. 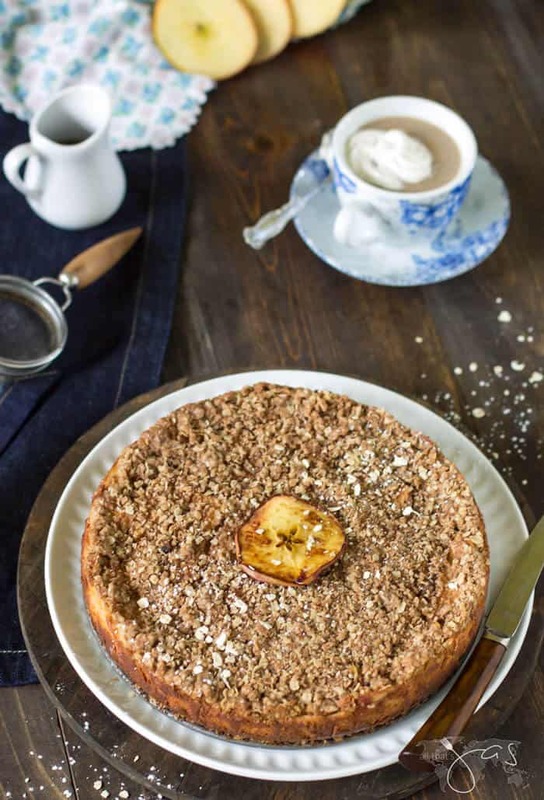 There’s nothing better to go with your first hot cup of joe than this Bavarian apple pie cheesecake. Trust me on this. P.S. Scroll down for links to more amazing apple recipes and make sure to enter the #appleweek GIVEAWAY! Drizzle apple slices with lemon juice to prevent from browning. Grease an 8-inch springform pan on the base and sides and then line the base with parchment paper (optional). In a food processor, pulse the oatmeal cookies until finely ground. 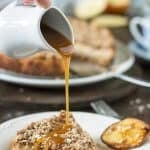 Combine with oatmeal flakes and melted butter. Firmly press the crumb mixture into bottom of prepared pan. Bake in a hot oven for 12-15 minutes. Allow it to cool. In a mixing bowl, beat the cream cheese with an electric mixer until smooth and creamy. Add cornstarch, vanilla, cinnamon, and sugars and mix until well combined. Pour the cream cheese mixture evenly over the cooled crust. Top with apple slices (any way you want). In a small bowl, combine flour, sugar, and cinnamon. Using a pastry blender or fork, cut in the butter until fine crumbs form. Sprinkle evenly over the apples. Place the springform pan on a baking sheet (prevents any leaks to the bottom of your oven). Bake in a 350 F preheated oven, about 40-50 minutes. Allow it to cool, then refrigerate for at least 4 hours before serving. Loosen the sides of the cheesecake with a knife, and then carefully remove the sides of the pan. The original German Brandt Hobbits Oatmeal Cookies is quite pricey and our local stores don’t carry it. Since we simplify recipes here at All that’s Jas to help you experience all kinds of foods, we used what we could find locally, for a fraction of the cost. $0.99 for a large package of Lil’ Dutch Oatmeal Cookies. Can’t beat that. Stocking my kitchen with different springform pan sizes literally saved me from numerous cake disasters. I still make a wrong call on occasion and end up having an extra thin cake, but it could be much worse. Do you like digging your fingers into butter? Neither do I. But I do like gadgets (like a lot!) and used this pastry blender to crumble butter for streusel topping. You know how you get more excited about a simple gift that is packaged nicely than the expensive one that comes shipped in a card box (well…initially at least, ha!). Serve this cake on a nice cake stand for that wow factor, although its taste alone will get you enough rave reviews. A dinner plate is fine too. 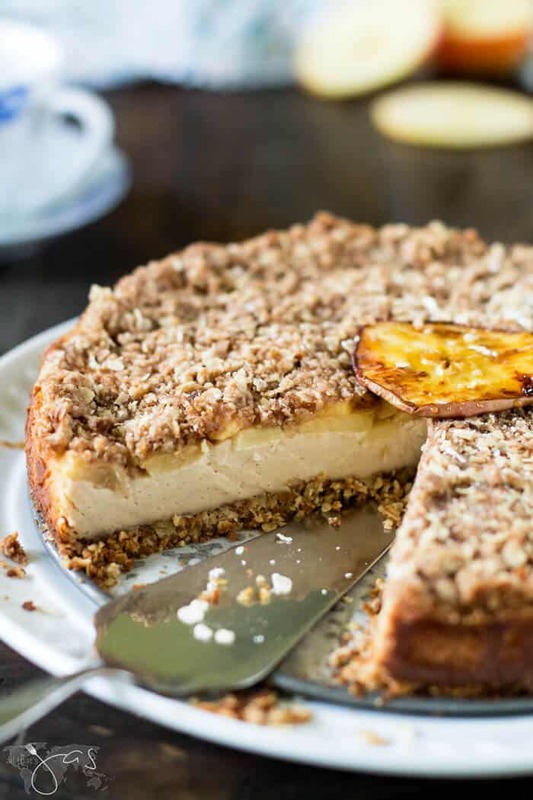 Amazing Bavarian apple oatmeal streusel cheesecake with oatmeal cookies for the crust, creamy filling, and a crunchy top to start your day off right! Find this recipe featured on The Dedicated House, My Busy Beehives, The Sweet Sensations, Lou Lou Girls, The Imparting Grace, Crafts a la Mode, Sugar and Spice and Family Life, Pieced Pastimes, From Playdates to Parties, Life on Lakeshore Drive, Nifty Thrifty Things, Wine Lady Cooks, and Scrapality. This looks AMAZING, Jas. Can’t wait to try it. Thank you, Camilla! By the time I try all the apple week yummy recipes, I’ll need to go on a diet. LOL. I thought this was perfect and then I saw the sauce being drizzled over the cheesecake and KNEW it was perfect. A cheesecake + apple pie = delicious! I love the delicate layer of apples on top of the cheesecake and below the streusel. I’m still loving this recipe and I’m loving that you shared it on the All Things Apple Celebrate 365 Blog Party! Now you know I already liked you, but if you made cheesecake an acceptable breakfast than I think it is time to take our relationship to the next level! 😉 This looks phenomenal and you are right, I think I might as well just start out making 2! Aw, we are getting serious now, haha! Hold the phone there Jas – cheesecake for breakfast? Are we soulmates? Yum! I love Honeycrisp! Pinning to try! Honeycrisp is my favorite! Thanks, Roseann! Oh my goodness! Please send a whole one to my house! I looooove cheesecake! Thanks for sharing on the Totally Terrific Tuesday link party! The flavors of this cake and the smooth texture of the cheesecake center, has my mouth watering! Your gorgeous photos add to the effect!! This little lovely screams fall and I can see why it only lasted a day. The Mr probably won’t eat it and that means you have to come over and so I don’t eat the whole thing by myself. Thank you for sharing with us this week at Celebrate Your Story, and I hope your week is going great. What a seriously amazing cheesecake! Love the creamy filling, crunchy streusel topping – well everything really! Pinning and sharing. Thank you so much for begin a part of the Hearth and Soul Link Party. Have a lovely weekend! Wow, this looks absolutely delicious! Thanks for sharing the recipe with SYC. Hi, Jann! Thanks so much and thanks for stopping in! OMG, once our kitchen is back in place, I can’t wait to give this recipe a try. My kids will probably love you for it too! Thanks so much for sharing at the #happynowlinkup! I really can’t say enough about how yummy this cheesecake was. Well, hello there! So happy you love cheesecakes too 😀 Thanks for stopping in, Rhonda! Your Cheesecake will be delicious, can’t wait to try it! Hope you have a great weekend and thanks so much for sharing your post with us at Full Plate Thursday! Jas, this looks absolutely delicious & I pinned. Funny about y’all eating it in one sitting! That’s probably what we would do too. I see you’re using Honey Crisps. They are not only delicious by themselves, they seem to be the cooking apple of choice. Wish I had a slice right now! Honeycrisps are my favorite apples and I use them in everything! Thanks for stopping in and have a wonderful week ahead! Hi, Jen, my fellow cheesecake lover! 😀 I’m so happy you like it and I hope you’ll make it. You won’t regret it! This looks so decadent but also absolutely lovely. Thank you, Elise! It really is a delicious treat. This one looks good too!! Cheesecake is my favorite but I have never had it with apples. I’m very intrigued. Your recipes are amazing! so glad I found your blog. Oh, my word, Jas. Your recipes always look tempting, but this one–I think you may have outdone yourself!! Of course, your beautiful photos help, but I think it’s mostly that your kitchen creations are just amazing. I’m so hungry for apples in the Fall! Thank you for sharing the goodness. Aw, you’re too sweet, Richella! Thank you so much for loving this recipe enough for the feature. I am honored! Saw this on the Imparting Grace link party. Looks so yummy. Grinned and Pinned! I know I could easily eat this in one sitting. It looks so scrumptious. Now I know what to make for my friend’s birthday cake. This looks absolutely delicious! I loved your comment that it serves two, lol! I’ll be featuring your recipe tomorrow night at Best of the Weekend! Yay, thank you, Amy! I am honored. Wishing you a wonderful weekend ahead!